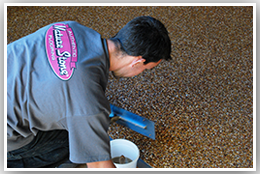 After 27 years in business it is humbling that the name NATURE STONE® has become synonymous with stone and epoxy flooring. Amazingly, despite our popularity, the most common questions by our customers remain the same …Who and what is Authentic NATURE STONE® Brand Flooring, where and why is it used and how much does it cost? Authentic NATURE STONE® Brand Flooring is a custom blend of fine stone and our specially formulated patent-pending epoxy, expertly applied over your existing concrete…designed to not only provide beauty and long-lasting durability, but to solve your concrete problems. When it comes to cost, the common perception is that NATURE STONE® Brand Flooring is expensive. The reality is that NATURE STONE® Brand Flooring is very affordable especially when considering its problem-solving benefits, longevity and warranty. 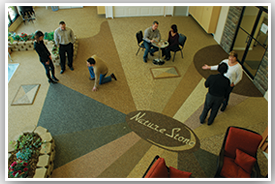 The cost of NATURE STONE® Brand Flooring can vary dramatically depending on the many factors of each customer’s unique concrete conditions. Today, Authentic NATURE STONE® Brand Flooring is the leader in the stone and epoxy industry throughout the United States. Over the years I have seen the good, the bad and the ugly in an industry I helped create. There is a deep and sincere desire on my part to share with you the history of Authentic NATURE STONE® Brand Flooring and the benefits of my experience in the stone and epoxy industry. It hasn’t been easy. More than 27 years ago I was looking for a way to reduce costly concrete repairs in my Concrete Doctor business. There was no grand plan…it was simply a way to make a living and support my family. Having seen similar products, I began experimenting with epoxies, stone and various mixtures, believing there was some potential magic that could correct deficiencies in concrete…and Authentic NATURE STONE® Brand Flooring was created. After experiencing the pitfalls of the poor performing materials that were available, if Authentic NATURE STONE® Brand Flooring was to going be successful, there was a need to dramatically change and improve the quality of the materials, their overall performance and the installation process itself. We also needed to establish the features and benefits of Authentic NATURE STONE® Brand Flooring by independent testing to support and verify our claims. The next step proved equally challenging; market, advertise and educate the general public as to the many features and benefits of Authentic NATURE STONE® Brand Flooring. We have made many changes and improvements over the years and as always we continue striving to improve NATURE STONE® Brand Flooring, as well as the stone and epoxy industry in general. What has not changed is the excitement of our customers as they experience the magical transformation of an Authentic NATURE STONE® Brand Flooring floor and our commitment to satisfy our customers. I remain sincerely grateful at the overwhelming success and popularity of Authentic NATURE STONE® Brand Flooring. Having installed more than 20 million square feet for more than 50,000 customers, NATURE STONE® Brand Flooring has proven to be especially popular for use in garages, basements, rec rooms, laundry rooms, sun rooms, patios and pool decks. NATURE STONE® Brand Flooring is also used extensively for commercial applications, often being specified by architects, for areas such as showrooms, retail areas, office areas and entrances. You can imagine how flattered all of us were to recently learn that so many real estate agents specifically mention NATURE STONE flooring as a selling feature of the homes they have listed for sale. More than anything, that is truly a testament to the overwhelming acceptance and popularity of Authentic NATURE STONE® Brand Flooring, and more importantly, its ability to not only beautify your home but also increase your home’s value.